It’s 5:30 in the morning on my last day in Cancun. I brew a quick cup of coffee in my room to take along with me to watch the sun rise over the ocean. I can tell, the day is perfect already. The sand is cool on my feet and the water still warm as it splashes against my ankles. Sea birds screech as they fight over sardines stunned by the surf. Hotels stretch out along the shoreline, twinkling like a long string of Christmas lights. Even though I can see a trace of the sun’s rays on the horizon, it hasn’t yet thrown any light on the scene. The moment is ripe with possibility. From here, we start over and over, and over. I was seven the year my family went to Nags Head N.C., my first time at the ocean. 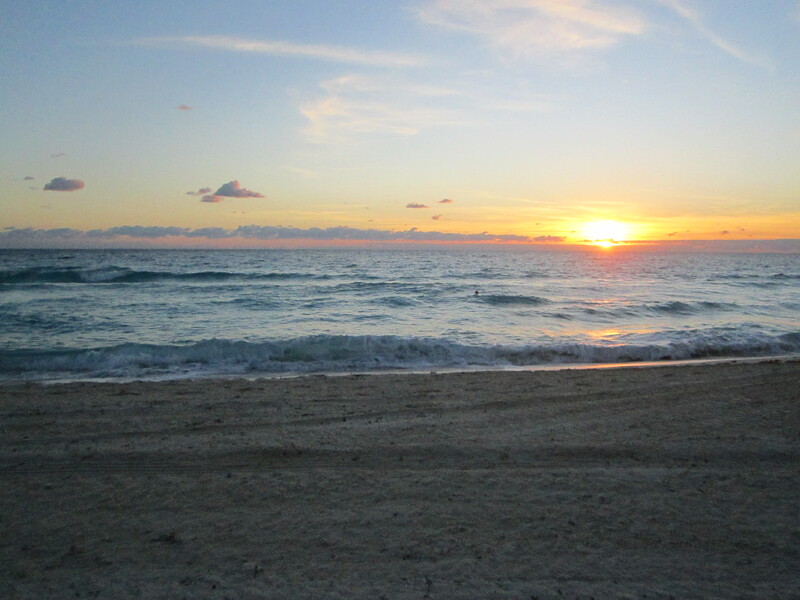 Every morning at 5am, my grandpa Joe woke me up to walk with him along the beach. 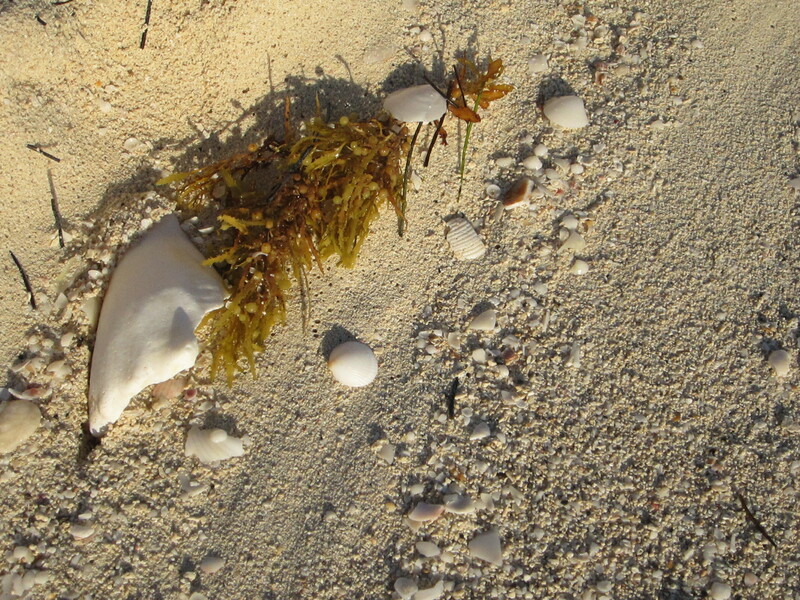 We trolled for sea shells, and other small treasures deposited by the sea overnight, while we’d been sleeping. My grandpa didn’t talk much, but I loved those morning adventures with him. I’d make him stop to dig through caches of shells left by the receding tide. I’d cram the pretty ones in the pockets of my shorts until they bulged. 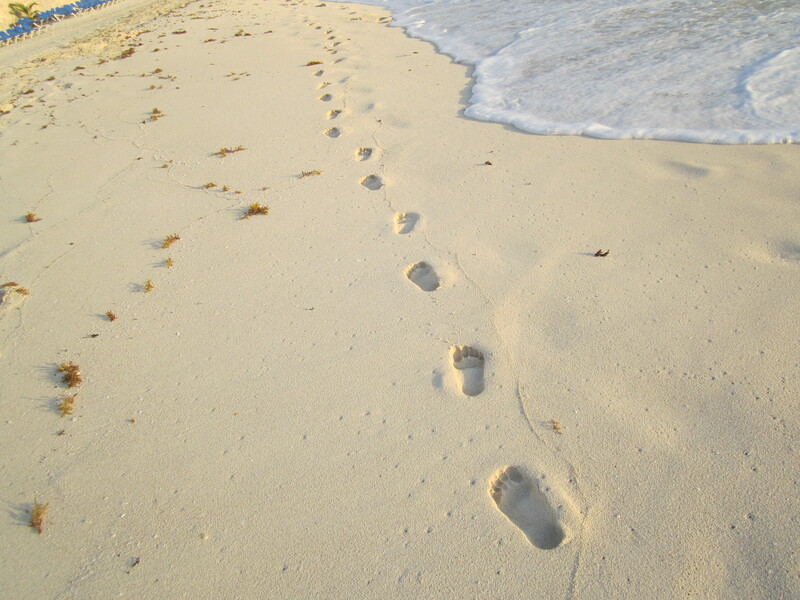 I’d walk in the soft sand behind him, reaching my stick skinny legs to try to place my feet in the footprints he left in front of me, an impossible feat, but I tried. Those walks were a magical time of day, before I could get in any trouble for dumb things kids do. It was a quiet and easy time. I was free to run and fall and get dirty along the way. The shells I collected back then are long gone. In fact, I think my grandma made me leave most of them there. She said they stunk too bad to take along in the car on a fourteen hour drive back home. But the memory of those walks are etched in my brain like a road map, still pointing the way. My grandpa generously invited me into his morning ritual. He took me out into the world to run free and explore whatever was out there. He bestowed that small gift of love on a little kid who had no idea, at the time, how big the ocean really was.